With Hurricane Irene still not finished doing its damage, feelings are mixed. Many who thought they'd be harmed were not, and they're feeling like "the hurricane was no big deal." But others lost loved ones and / or lived through some terrifying hours. This terror can come back to haunt them in the future. Many who live through traumatic spiritual, mental, or physical experiences are able to take them in stride, recovering quickly. Some later suffer from Post Traumatic Stress Syndrome and are diagnosed and given help through counseling and medication. Others simply live in fear that the experience will be repeated. Often they will withdraw from life, entering into a sort of mental half-sleep that helps them avoid thinking about the traumatic event. Of course, sufferers become alienated from their Higher Selves. Note that at times, a traumatic event can trigger a symptom that appears totally unrelated to the event. For instance, a person hearing bad news may lose their sense of hearing. Others, depending upon the source and the severity of the trauma, may develop problems with eating, speaking, walking, or other physical functions. Whether the trauma is large or small (such as experiencing a close call), Star of Bethlehem can restore the energetic balance and allow the fear to dissipate. Years ago I knew a woman who should have been treated with Star of Bethlehem. She had been injured in a car wreck when she was driving and refused to ever drive again. This was in spite of the fact that she had been stopped at a red light, so the accident not have been caused by her presence behind the wheel. Most would call this an irrational fear, but for her it was real. 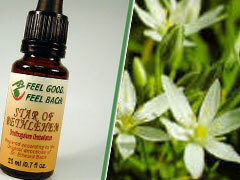 If you or someone you love suffers from the after-effects of a traumatic event, try Star of Bethlehem. Life is meant to be enjoyed to its fullest.